Some Episcopalians have been reacting to Curry’s sermon on social media by using the hashtag #proudEpiscopalian, and St. Bart’s Episcopal Church in New York is hoping the excitement will increase turnout at the congregation’s “Bring a Friend to Church Sunday” on June 3. Authenticity was so powerful at a time when there is so much deception. We attend St. Mark’s Episcopal Church on Capitol Hill. Our minister is Michele Morgan and her wife is Michelle Dibblee, Director of Programs at the National Cathedral. We expect and pray that this same momentum which started at Lent, the 40 days before Easter with Gene Williamson 1st Gay Bishop in America will be divinely led by God to include all. We believe that God loves all the same, gay and straight! What did Jesus say about same gender relationships? Answer: NOTHING. Love wins. Pray for our cases at the US Supreme Court 17-6685 and 17-7310, two church arrest of lesbians (while preparing refreshments) with mandated “Conversion Therapy” to be ruled unconstitutional. Global Revival is Bishop Curry’s Prayer. Let’s join him! Love is the answer. All we need is love! 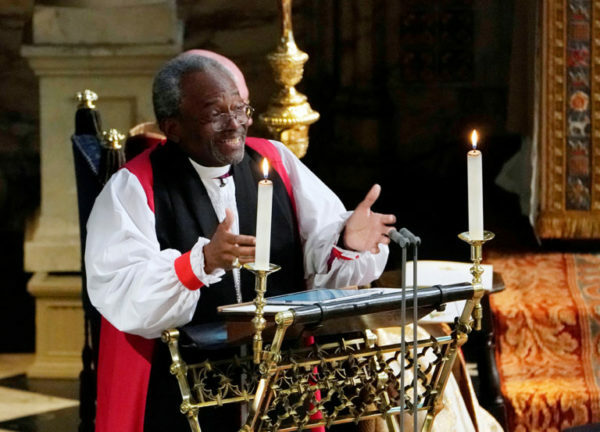 In the powerful sermon of Bishop Curry we hear the message of the Gospel in new and exciting ways. It reminds us that we are inheritors of the grand gospel message to love one another. As Bishop Curry challenges imagine a world governed by love. To the new Duke and Duchess it’s to their credit that they have made that the thing of their marriage to each other much to our benefit worldwide! I was embaressed by his lack of. Sober and solemn range of voice. I thought I was in a Evangelical Baptist Church from the south. Not my beloved Episcopal dignified church. Marcia Silliphant, I don’t know where you attend an Episcopal Church, but you are behind the times. Cursillo Weekends have brought fire to our church and many others. We no longer hold back, we give out! We share our love freely in and out of church services. We even had an Episcopal tent revival here in SE GA and Bishop Curry was here. Stop being the “frozen Chosen” we aren’t that any more! 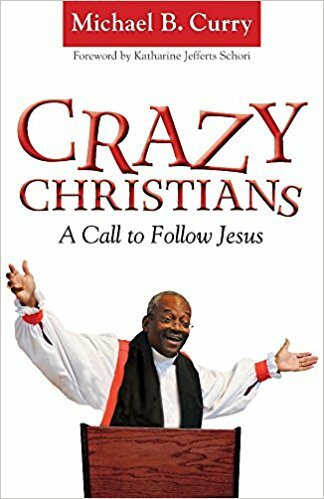 Thank God for Bishop Curry and his Deep South evangelism! It is now my undignified loving member of the Jesus movement Episcopal church! I wish Bishop Curry could address the United Nations on a theme like that. 1 Corinthians 13 might have packed more power. Guess they didn’t want to go that deep! Thank you Bishop Curry for such a lovely, passion filled sermon that told the whole world that what we all need to express to our fellow man is love. 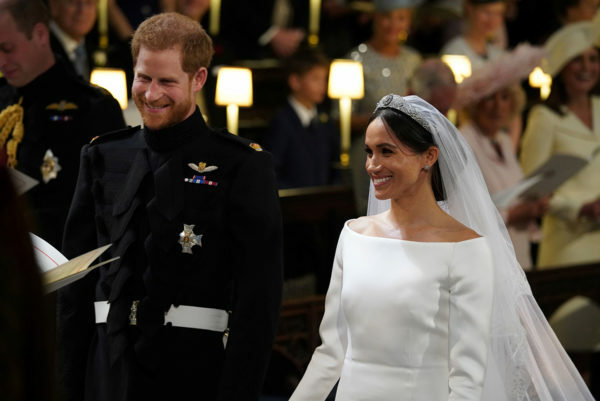 I am so impressed with Prince Harry and Meghan that they would choose to focus on love. I’m think that we’re going to see great things from these newlyweds! May God Bless and Keep Them! (I attend St. Martin’s in The Desert Episcopal Church, Pahrump, NV. What a blessing Bishop Curry is to this world! Authentic, joyous, hopeful, deeply faithful in his love for Christ, and dedicated to the inclusiveness of His teachings. The Episcopal Church has received an injection of new life. Thanks be to God and Bishop Curry! ++Michael Curry didn’t use notes, rather he made eye contact with people. He was passionate and knew his sermon inside out. Interestingly, he brought a fresh language to a timeless topic of marriage and love. Some people may not like this but he changed the focus of the whole ceremony from the Royal couple to the God. In these troubled times Michael Curry pulled me to recommittment to transform with love and hope to do the work of justice with the gentle but firm prodding of Jesus. I cannot wait until June 14th when Presiding Bishop Michael Curry will be preaching at Saint Mark’s in Seattle, then a few weeks later at General Convent>n in Austin. What a blessing God has sent us on the eve of Pentecost!!! 2 BILLION people heard the GOOD NEWS of the Love of Jesus Christ from the lips of His servant Michael Curry!!! And I believe that is exactly what Prince Harry and his bride Meaghan intended! Praise God for their Faith as well. To the one woman above who has not yet received the full joy of that message, I pray for you, my sister, that your Joy may be complete. Wow what a show of “love” by Sissy Lingle attacking Marcia Silliphant saying “… you are behind the times…” I have no objection to Bishop Curry’s sermon IF it were given from the pulpit NOT a wedding ceremony where the bride/groom are supposed to be the stars! Sadly love does NOT cure societal ills-actions help eliminate poverty, homelessness and despair. Kindness towards one’s fellow humans is also. Paying for a meal for a homeless person or a person who is infirmed is a good start. Maybe those actions of kindness will generate “love” about which Bishop Curry spoke. The Psalmist tells us, “Let the righteous be glad, and rejoice before God; let them also be merry and joyful.” Ps. 68:3. I think Bishop Curry fulfilled this perfectly. Not so stuffy as to be off-putting, but lively and engaging, and certainly merry and joyful. At any rate, the bride and groom were pleased, and the rest of us also enjoyed the sermon. I’d be delighted to listen to him every week, if I could! Mr. Waters, what is the Great Commandment that Jesus preached about? Love comes FIRST, the tangible actions and consequences follow. Unfortunately, Ms. Silliphant’s tongue-in-cheek sneer about the Presiding Bishop and Primate of the ECUSA not belonging in her interpretation of her “beloved Episcopal dignified church” illustrates that we have a long ways to go…. I think it is counterproductive for any one person to decry another’s thoughts on a site like this. More importantly is to appreciate the love message Bishop Curry offered up. and to be grateful for the inclusive choices the newlyweds made as part of their commitment to their lives together. Inviting PB Curry to share the message of love, what he calls “the Jesus Movement” was a strong statement from the couple. They knew what to expect when they asked him to preach, and he delivered the message loudly and clearly.. 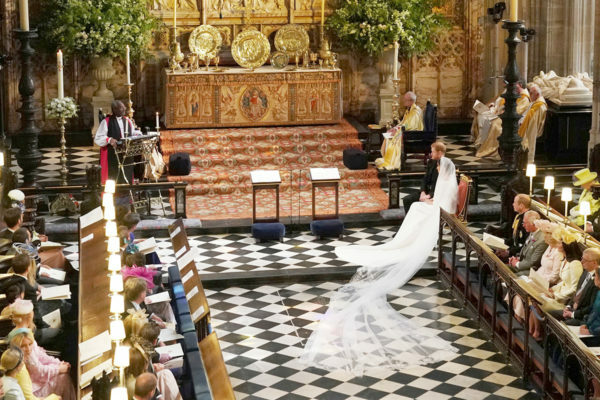 I hope many also caught the wonderful part of the Anglican sacrament of marriage that includes God as an integral part of their union. Larry Waters: When a wedding is held in a holy and consecrated place (i.e. a church), the focus IS ON GOD! No if, ands or buts about it. I’m glad that you have been introduced to Marcia. And I am terrible a spreading love, myself, so don’t get bent out of shape over that! Godspeed! Hahaha Saturday Night Live doesn’t let anything pass and make it funny.